Dungarvan is a harbour town located at the heart of County Waterford on the doorstep of the Comeragh mountains with its breathtaking waterfall and country wide view of the sunny south east. It has many pretty beaches nearby, as well as being adjacent to the World Heritage Copper Coast. On the other side of town in the areas known as An Rinn (pronounced Ring) is a Gaeltacht or Gaelic speaking area which is renowned for its traditional Irish music and steeped in Irish history and folklore. Coastal drives are very popular along the scenic copper coastline. A more inland route will take you along the Comeragh Mountains and Mahon Falls, where, for the hill walker some really great walking routes await you. There is also the Nire Valley walking festival in October each year. Along the coastline route you will visit Dunmore East, Tramore, Bunmahon, Annestown, Stradbally Cove, Clonea and Ardmore,fearuring a number of other beautiful little villages and towns along the way. The greatest treat is the numerous sandy beaches that you can stop off for a stroll along. Historic sites are also within close proximity to the hotel and with our Deise traditions dating back to Viking times you can visit St. John's Castle, St. Augustine's Abbey Ruins, Lismore Castle, Lismore Towers and Gardens, Glencairn Abbey, Mount Mellaray etc. The region is also popular with golfers and 3 excellent 18 hole championship golf courses are on offer close by. With its coastal location water sports are very popular along with sea fishing and river angling. The region offers a wide selection of festivals and Dungarvan town has a weekly farmers market and country market. 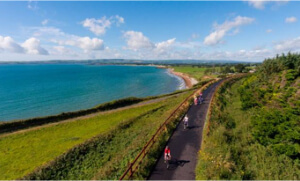 Waterford Greenway is a spectacular 46km cycling and walking trail along an old railway line which takes you from stunning Dungarvan all the way to the quays of Ireland's oldest city (Waterford). Breath taking views across Dungarvan Bay traveling to the town centre. The Ballyvoile 400 metre brick-lined tunnel is as fresh as the day it was built and discreetly lit to keep it's magic. The Durrow 7 arch and Kilmacthomas 8 arch viaducts are engineering marvels. These world famous gardens are directly accessible from the Greenway. 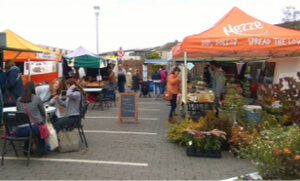 Dungarvan Farmers Market is held in Grattan Square, Dungarvan every Thursday from 9.30am to 2.00pm. The Farmer's Market boasts a wide range of produce, from farmhouse cheeses, fresh fish, eggs, ready-made meals, cakes, gluten free cakes, chocolate products, artisan bread, honey, desserts, and even flowers and plants for your garden, and lots more too! Savour a fabulous lunch from Hartrey Kitchen's Indian food stall, or Sicilian food from Gusto, or try Dvir's Middle Eastern feast from Mezze. Or come along and enjoy a coffee, or one of Yurgen's renowned hot chocolates, with Fabrice's Breton crepes, and soak up the atmosphere of the market and Grattan Square. Dungarvan Castle is an Anglo-Norman fortification founded in 1185. It was built in a very strategic location at the mouth of the River Colligan. From here, ships could be anchored and soldiers could command the narrow strip of land to the south of the Comeragh Mountains which linked East and West Waterford. The castle consists of a polygonal shell keep with an enclosing curtain wall, a corner tower and a gate tower. The shell keep is the earliest structure, dating from the 12th century 'Norman Invasion of Ireland'. This castle was built by King John of England and is a typical example of a British Royal Castle. See Dungarvan Tourism for more information. 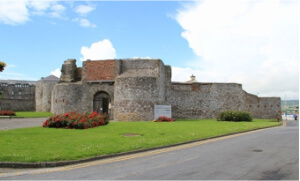 The Museum is located in Dungarvan and is dedicated to preserving and promoting the history of the locality. Museum is operational largely through voluntary effort. Open 10.00 a.m.- 5.00 p.m., Monday - Friday and admission is free. Please note that there may be Saturday opening during the Summer months. Groups are welcome, please contact them in advance. 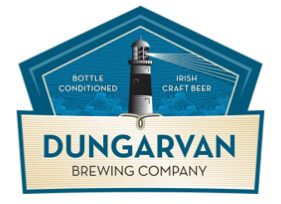 Dungarvan has a rich history of brewing which Dungarvan Brewing Company are proud to have revived. The West Waterford region is also home to a strong food culture — both with food production and a thriving restaurant scene both of which are celebrated annually at the Waterford Festival of Food. They offer a tour of their facility, talk about ingredients/brewing process and beer tasting. During the summer, they run their ‘Summer Series’ of tours and beer tasting from 5-6.30pm. See Dungarvan Brewing Company for more information. 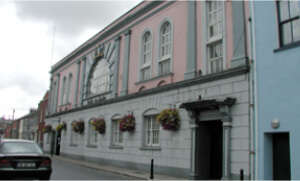 SGC Dungarvan is a luxury 4 screen cinema located on High Street, Dungarvan, Co. Waterford. SGC Dungarvan, bringing you blockbuster entertainment at the greatest value. SGC Dungarvan is a luxury 4 screen cinema located on High Street, Dungarvan, Co. Waterford. SGC Dungarvan, bringing you blockbuster entertainment at the greatest value. The Monday Meal Deal is €10.00 and includes Medium popcorn/nachos + Medium drink The Large Sweet Deal is €15.95 and includes large popcorn + large drink + large bag of candy, catering to those with a sweet tooth and is on offer every day of the week. Kids Pack is €6.50 and includes small popcorn, kids drink + bag of sweets (€4 for Kids Club movies) Adult ticket is €8, Child ticket €5, kids club movies. For screen times see SGC Dungarvan. 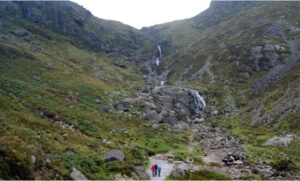 Mahon Falls is an 80m waterfall nestled in the Comeragh Mountains near Lemybrien, County Waterford. There is a car park close to the falls with a not too strenuous walk to get to them. The dramatic waterfall which is surrounded by breath taking beauty makes this a trip not to be missed. Did you know that we have a “Magic Road” here in Waterford? Well we do and it is magic! If you park your car at the bottom of the hill and take the handbrake off then the car will roll backwards! The road is in the Comeragh Mountains that leads you to the magnificent Mahon Falls. Is it the work of the little people? Can it be some mystical power of the ancient mountains? Is there some hidden power force that transcends all logic? You will have to go yourself and find out! It is free to visit 24 hours a day. 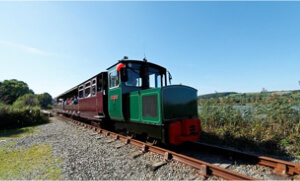 Experience the beauty of the Suir Valley from a partially open carriage as you take in the panoramic views of the river and rolling farmland of Waterford and across to Kilkenny. This is an area rich in history and beside Waterford Greenway. The railway journey is an enjoyable experience for all ages. Discounted rates are available at reception. Family Discounted Package for Park Hotel Residents: 2 adults and 2 children €20. Any additional children are extra €2 each. Trains Depart on the Hour. See WSV Railway for more details. Explore the vast Blackwater with our guided canoe tours. 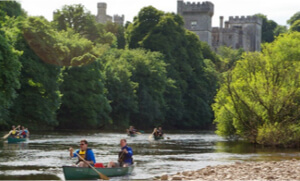 Canoe your way from Cappoquin to Youghal and experience the power and beauty of the Blackwater. Or, you can choose to finish up at one of the many historic houses and gardens along the way. Whatever you decide, the river guides will introduce you to a world that will enlighten your imagination and bring untamed wildlife together with the unspoilt beauty of the surrounds. This trip lasts in the region of 3 hours and is priced from €35.00 per adult. Family rates available. Lismore is approximately 20-minute drive from Dungarvan. It is a small heritage town with beautiful gardens on the grounds of the castle. The historic gardens of Lismore Castle are essentially two distinct gardens. Both are set within the castle walls and comprise of 7 acres with spectacular views of the Castle and surrounding countryside. 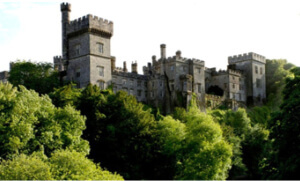 See Lismore Castle Gardens for more information. This walk brings you on cliff-top paths, minor roads and laneways past Early Christian St Declan's Well, Ardmore Round Tower (one of the best preserved in Ireland) 12th Century Cathedral and a lookout post with a variety of flora, fauna and birdlife. This is a unique 4km walk with beautiful sea scapes. Breath-taking views. Legends. Wildlife. Battle sites. And don’t forget, it’s simply smothered in Irish Heritage. It should take you around an hour to complete. Look out for the yellow arrow on brown background marks to led the way. 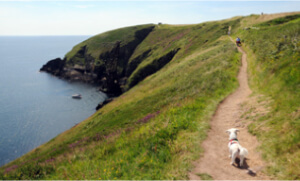 From the village, head up past the Cliff House Hotel to go around Ardmore Head and Ram Head. This walk brings you on cliff-top paths and the laneways of the Early Christian St Declan’s Well. On the 24th July each year, the well is a place of pilgrimage for 100’s of years. Look out for the crosses hand-scored into the stones of the building. And, if you’re in Ardmore in July make sure you try to get to the pattern festival. Continue towards the Ardmore Head and soak up the simply amazing views. See Ardmore Waterford for more. Children under 24 months free of charge. 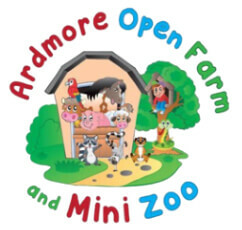 See Ardmore Open Farm for more details. 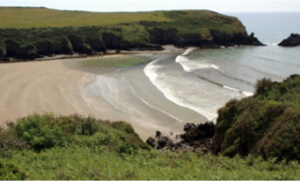 Stradbally is a lovely and most unusually shaped cove, which is great for swimming, sunbathing and playing. Protected by cliffs on either side Stradbally is well sheltered and when the tide is out there being a wide and long expanse of soft sand. This is an ideal place for families as, along with the wide-open spaces, there are pools for kids to play in and rocks for parents to rest beside. There is also a river which runs along the left-hand side into the sea. The water here is clear for swimming with the bottom mainly sandy. Over to the left there is a rocky area underfoot when the tide is out. There is a smallish, sandy car park which can fill up quickly in the summer. There is also a solitary picnic table in the car park. The Copper Coast UNESCO Global Geopark and Visitor Centre is located between Tramore and Dungarvan in County Waterford. It extends between Fenor in the east to Stradbally in the west and up to Dunhill in the north. The area was declared a European Geopark in 2001.The Copper Coast gets its name from the 19th Century copper mines that lie at its heart. It comprises some 25 kilometres of spectacular coastline consisting of scalloped beaches and coves buttressed and enclosed by rocky headlands. Oceans, volcanoes, deserts and ice sheets all combined to create the rocks, which provide the physical foundation of the natural and cultural landscapes of the Copper Coast. ‘The Vee’ refers to a V-shaped turn on the road leading to a gap in the Knockmealdown mountains. The Vee itself is on the Sugar Loaf, but the pass from Tipperary to Waterford runs between Knockaunabulloga and the Sugar Loaf. The Vee is predominantly famous because of the breath-taking panoramic views afforded to travellers and sight seers going through the pass. 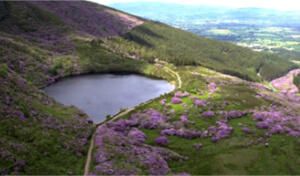 The journey rises to about 2,000 feet (610m) above sea level above Bay Lough, and as it does so it gives wonderful views of a portion of the ‘Golden Vale’ between the Knockmealdown and Galtee Mountain Ranges. On a clear day (or night) the Vee affords views along and across the valley to Clonmel, Cahir, Ardfinnan, Clogheen, Ballyporeen and even Cashel. You can also see the Galtee Mountains across the valley, the Comeragh Mountains along the valley and Slievenamon, behind Clonmel, quite clearly. Mount Congreve House was built in about 1760 by the local architect John Roberts, who subsequently designed and built most of the 18th-century public buildings in Waterford, including both cathedrals. His client was John Congreve of Waterford, whose father the first Ambrose Congreve had played a prominent part in the development of the city until his early death in 1741. 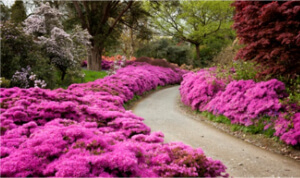 Mount Congreve gardens are open Thursday to Sunday, 11am to 5.30pm. Last entry to the gardens at 4.30pm. See Mount Congreve for details. Mount Melleray Abbey, found outside Cappoquin, County Waterford, was the first monastery founded in Ireland following the Reformation. When the French government forced out all foreign monks at the Cistercian monastery of Mellery in France, a group of Irish and English came to Ireland in search of land. 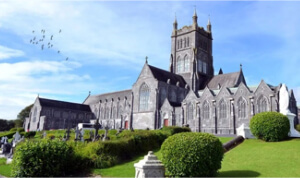 Sir Richard Keane granted their wish, 1832, they established Mount Melleray Abbey. Today, the abbey continues to be a tranquil religious community. The exhibition centre outlines the history of Mount Melleray in word and picture, through a series of panels. These begin with the arrival of the Cistercians in Ireland through to the ages. Guests are asked to respect the sanctity of the place. See Mount Melleary Abbey for details. 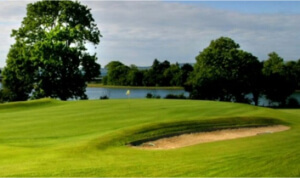 Dungarvan Golf Club is an 18-hole Championship Parkland course located outside the town of Dungarvan, County Waterford. 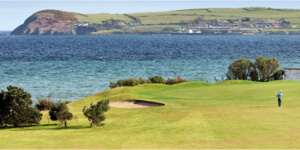 The course is adjacent to Dungarvan Bay and set against the backdrop of the Comeragh mountains. Since they moved to their new location at Knocknagranagh in 1993, the progress has been remarkable. The top-quality Championship course, practice area and clubhouse were included in Golf Digest’s `Top 100 Irish Courses` in 2007. They invite you to dine, and enjoy some wonderful scenery overlooking the course in the Clubhouse Restaurant. Relax in comfortable surroundings, savour the ambience and retire to the lounge. Prices include; €30 weekday and €38 on the weekend. To book please see Dungarvan Golf Club. A dramatic backdrop is provided by the Comeragh and Knockmealdown Mountains to the north and east and the Drum Hills immediately to the south. An interesting feature is that the first nine holes are laid out on a large plateau featuring a lovely stream which comes into play at the 3rd and 4th holes. The Brickey river traverses the southern boundary and features on the challenging 2nd, 12th, 14th, 15th and 16th holes. The West Waterford Golf Club is built on 150 acres of rolling parkland on the banks of the Brickey River. The golf course is 4 km west of Dungarvan off N25 By-Pass on Aglish Road. Overlooked by the rolling Drum Hills, just minutes from the seashore and Dungarvan Bay. See West Waterford Golf for tee times and deals. 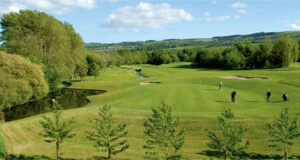 Gold Coast Golf Club, Dungarvan is a championship parkland course. There are unrivalled views of Dungarvan Bay, the Irish Sea and Helvick Head. Mature tree-lined fairways laid out in 1939 are cleverly mingled with the long and challenging newer holes. 18 holes, par 72, stretching 6,204 metres [6,785 yards] and bordered by the Atlantic Ocean for 1.5 miles. For more information please see Gold Coast Golf Club. 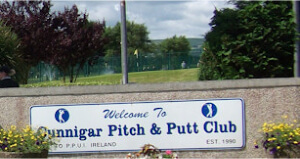 Cunnigar Pitch and Putt is an 18-hole championship course set in a very scenic part of Dungarvan. Surrounded by Dungarvan Bay. They welcome new members and visitors all year round (weather permitting). Opening Times: 9am - 6pm Green Fees: Adults: €5.00 Junior €3.00 Clubs hire: €2. (2clubs) lessons are also available. See Cunnigar Pitch and Putt Club for more. Tramore Amusement & Leisure Park is located within a safe, secure family environment, just 6 miles outside Waterford city. 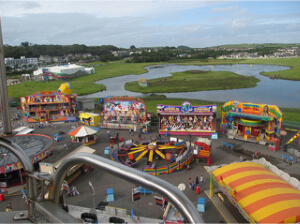 Tramore Amusement Park boasts a huge array of entertainment to keep everybody happy. Ride the Classic Mega Spin Waltzer, The Extreme Afterburner, The Crazy Mouse Spinning roller coaster and The Super Paratrooper. Swing to the beat on the future dance Miami. For younger children you will find a choice of three mega slides, Formula Car Track, bouncy castles, The House Party Fun House, Goldmine Express mini roller coaster, Teacups, Mini Dodgems, Gallopers, trampoline and much more. 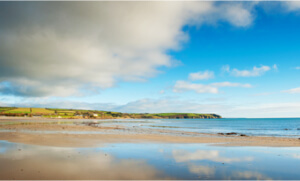 Tramore boasts a stunning 5km blue flag beach, popular for beach angling, rock and reef fishing. Saturday & Sunday: 1pm till 8pm. For more see Tramore Amusements. 70,000 square foot of indoor entertainment. Perks Entertainment Centre specialises in the art of fun-making – Boasting one of the largest indoor funfair entertainment centres in Ireland. Perks introduce a large selection of rides, games, attractions and their Showboat Casino. With over 70,000 square foot of indoor entertainment not even the weather can spoil your fun! Perks are world renown and cater for all ages. They also welcome school tours, corporate outings, social clubs & Birthday Parties are a speciality. FREE Parking, Wheelchair friendly and NO admission fee. Special appearances by Perkie Bear. Opening Hours: Monday – Friday from 1pm. See Perks Funfair for more information. 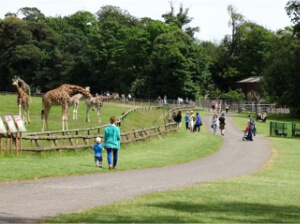 Fota Wildlife Park, part of the Zoological Society of Ireland, is located on 100 acres at Fota Island 10km east of Cork City and has an annual attendance of 440,000 visitors. It is currently the second largest visitor attraction in Ireland outside of Leinster. The Park’s core values of conservation, education, research and entertainment have ensured that we are uniquely placed to foster greater public understanding of the threats to plant and animal habitats and decreasing global biodiversity. Opening Hours: 10am-4:30pm every day.